It's Friday and I am happy about that. It's not been a bad week, but I am looking forward to getting some help around here. I have some projects in mind—some crafting and some cooking. I had a failed batch of lollipops and I am determined to not let beat me. Reading the thermometer correctly will help immensely, I think. I didn't have it submerged enough last time and so my sugar syrup turned black while never getting to the hard crack phase on the thermometer. Oops. It's just sugar and water, right? No biggie. Not like the 4 eggs and 2 cups of sugar I wasted when I forgot to put the flour (the flour!) in my pumpkin cake last weekend. That is still irking me, actually. Oh, cooking with the girls can be fun and so not productive. I blame them, for the record. 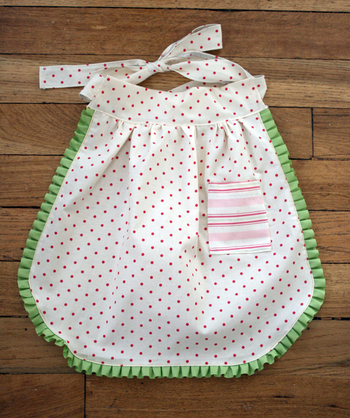 Here's my apron for Tie One On, the theme being Polka-dotted Lovelies. 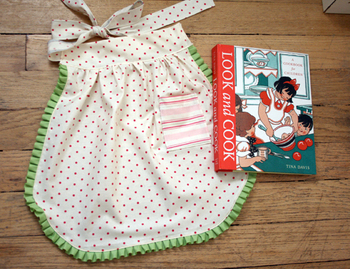 It's for a young girl, and I thought it would be a great gift with the cookbook there. That's my copy, which is well used. I love this cook book. I think there is a sewing version too, but I haven't seen it in person. This fabric is by Grand Revival and the ruffle is from my trim basket. -Julie over at Booga j reviewed a bread baking book that has been calling out to me. You have to read bout it, it sounds so cool! -The bloggies!!! I am honored to be nominated in the Best Craft/Art Blog category along with the other great blogs, not martha, PostSecret, posy gets cozy, and apartment therapy. I just had thai food with Alicia last night and am now planning on T.P.-ing her house, you know, as a gesture of friendly competition. And I got a chance to talk to Megan of not martha fame this summer, and she was so cool and swell, I feel totally comfortable driving to Seattle to T.P her house, too. This is my 3rd year being nominated and I think I have come in last each time. I assume so, because they list the winner, and then the other blogs. . .and I am always listed last. So one can assume, that, you know, I am last. So my goal this year is to be second to last. Vote! I always feel so excited to see the other nominated blogs are out there. I am going to check out the music ones for sure. I can only listen the Fraggle songs a bit longer around here before I go all hyphy.